If you like games filled with features and sparkling gems, then you are going to love what we have for you. 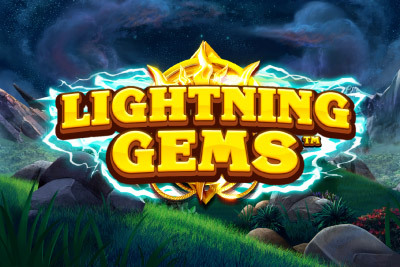 NextGen Gaming have created a slot that combines all the fun of a lightning storm and searching for magical gemstones. Step out into the wild weather and enjoy Lightning Gems and try to avoid being hit by the lightning if you can. Lightning Gems is a 5-reel, 10 fixed pay line slot, which offers players a reasonably high RTP of 96.48%. The reels are transparent and spin in front of a thundery night sky and mountain landscape, with music that seems almost out of place but strangely fits the game well. We love the addition of the sun symbols when the gems land a win and when the features hit too. It all adds to the atmosphere of the game and to the enjoyability. Bet Amounts – Betting begins at 15p per spin and can be increased to the maximum of £37.50, making it very affordable considering the higher RTP. You would expect a much higher stake range than is actually on offer. Amend your bet by adjusting the up or down arrows that are on either side of the coin stack to the right of the screen. Wild Symbol – A golden amulet of sorts is your wild symbol, it substitutes for all other symbols except the scatter. It is also the second highest paying symbol within Lightning Gems, offering a x500 coin win for landing 5. Scatter Symbol – What seems to be a white gem breaking out of stone is your scatter and landing three or more of these will activate the bonus spins. Scatter wins are also in play here and will be added on top of any other wins received. You may notice the scatter is your highest paying symbol offering a massive x2000 coin win for landing 5 in a win. Wild Nudge Feature – Available in both the base game and the bonus spins, this feature can happen at random. You will see that if a wild lands on the reels but is slightly off from helping create a win, it will be nudged into place to complete that winning combination for you. Wild Wins Feature – Also available in both the base game and the bonus spins feature is the wild wins and this too is random. Here you will see a golden amulet wild symbol spinning at the side of the reels. As it spins extra wilds will be added to the reels to help create some bigger wins for you. Bonus Spins Feature – To play the bonus spins feature you will have needed to land three of the scatter symbol anywhere in view. Once you have done this you will be allocated 10 bonus spins to play through. You can retrigger the bonus spins from within the feature by landing three more scatters and you will see at the beginning up to 50 wilds have been added to the reels too. Not only that you have both the Wild Wins and the Wild Nudge features both active here as well. 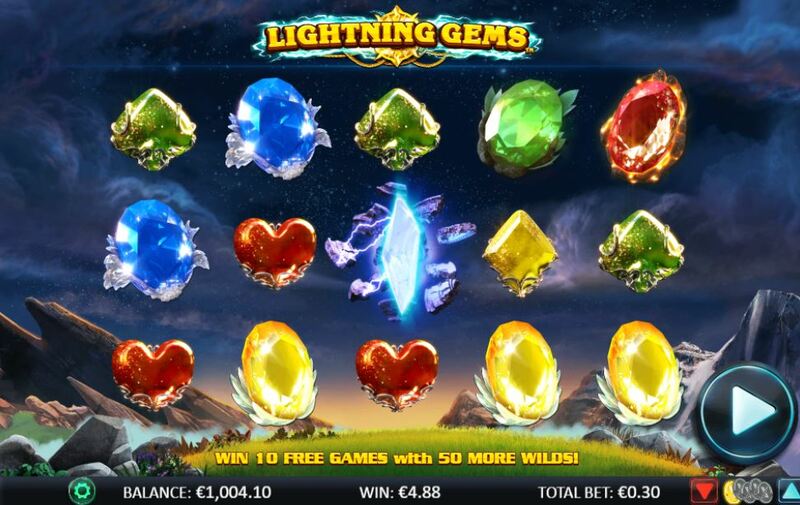 Lightning Gems is a great slot with lots of fast paced wins occurring within the base and the bonus game. It’s easy to land smaller wins due to the two mini features the Wild Wins and Wild Nudge, but you will see bigger wins coming too. Considering the stake to play is so low this is probably why the game is proving very popular with the online casino community. 10 bonus spins doesn’t seem much on the face of things, but then you add in 10 extra wilds per reel and things change.